Beautiful 4" IPS display you can view from across the room, no squinting necessary. ZigBee was designed for IoT. And our thermostat puts the T in IoT. A-1732 has a longer range than WiFi and with ZigBee Mesh Networks, you can even extend the range. Fidure's ZigBee t-stat works with your Home Automation system, integrating with your existing hub that already controls other devices. We're already compatible1 with many Smart Home Hubs making it easier to be Smart. 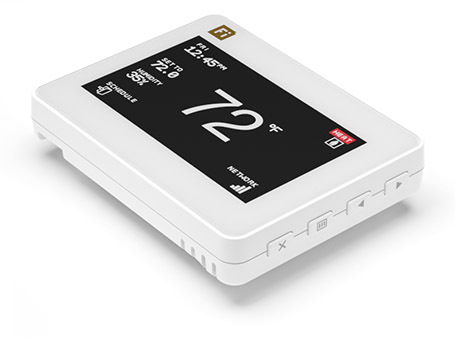 A smart t-stat priced like a dumb thermostat. Budget friendly with a payback of weeks, not years. Adaptive algorithm adjusts automatically to the conditions. Gentle on your HVAC equipment. Numerous features, you can easily change and update by navigating through on-screen menus. Leave the cloud connectivity to your Smart Home Hub. More secure, faster, and how it's supposed to be. Crisp, high-resolution display with adjustable brightness. Have it dim low-light or even turn off the screen. Powered by the 24V "c-wire". No need to worry about battery degradation. Check your wiring for compatibility. 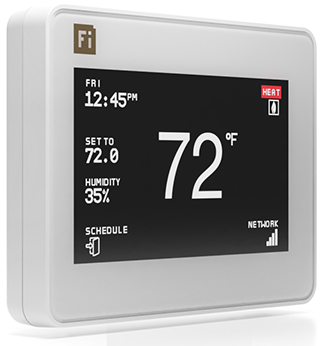 Multiple Lock-Levels put you in control of Temperature, Modes, or just lock everything. Comfort is not just temperature. Measure and Account for humidity. Best solution for thermostats not located in the perfect place. 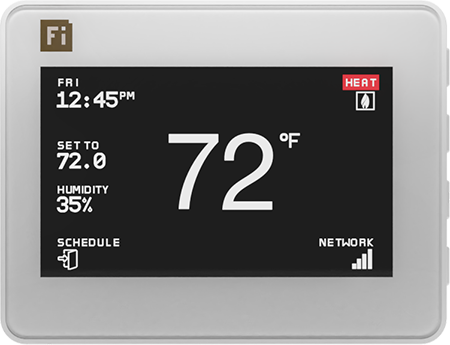 Control your thermostat from wherever you are3. Innovation without compromising your wallet. Set it to automatically switch between Heat and Cool. For the seasons with hot days, and cold nights. You decide when the schedule resumes, tomorrow, next week, or next year. Up to you. Baby's room cozy like the living-room. Set the thermostat to use your own ZigBee HA temperature sensor instead of its internal sensor2. A1732 never sleeps. This means no delays when you send it a command over-the-air. Acts as a mesh router. Allows you to add devices that are too far from your hub, extending the hub's range. Easily navigate the menu system using the four tactile buttons. 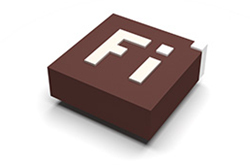 Contact Fidure for datasheets and additional product information. 1) Contact Fidure for questions regarding Compatibility. 2) Paring procedure is performed via ZigBee Hub. 3) Requires a compatible Home-Automation Hub. Founded in 2006, Fidure© Corp. brings modern technology to buildings and homes. © 2018 Fidure Corp. All Rights Reserved.